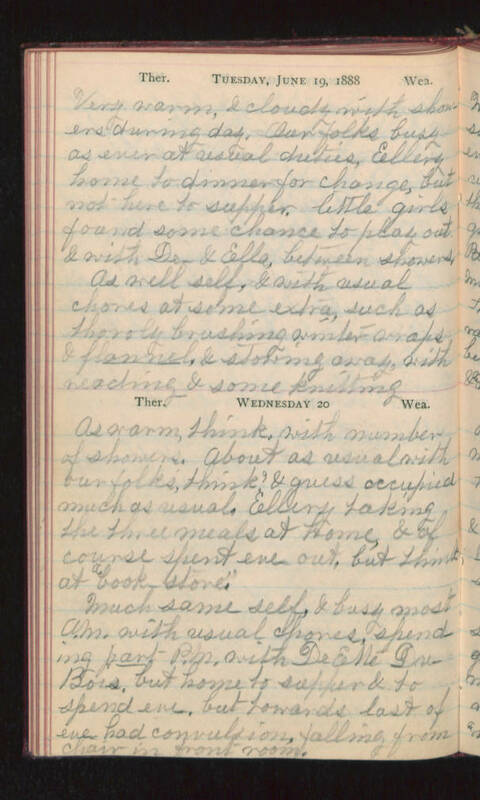 Tuesday, June 19, 1888 Very warm, & cloudy with showers during day. Our folks busy as ever at usual duties, Ellery home to dinner for change, but not here to supper. little girls found some chance to play out & with De- & Ella, between showers. As well self, & with usual chores at some extra, such as thoroly brushing winter wraps & flannel, & storing away, with reading & some knitting. Wednesday 20 As warm, think, with number of showers. About as usual with our folks, think? & guess occupied much as usual. Ellery taking the three meals at home, & of course spent eve out, but think at "book store". Much same self, & busy most A.M. with usual chores, spending part P.M. with DeEtta DuBois, but home to supper & to spend eve, but towards last of eve had convulsion, falling from chair in front room.